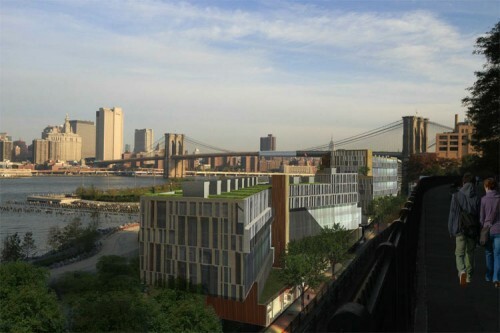 Just as rolling hills of green lawn have replaced the industrial waterfront at Brooklyn Bridge Park (BBP), two new buildings by Rogers Marvel Architects will soon mask the terraced autopia of the Brooklyn-Queens Expressway cutting off Brooklyn Heights from the park below. City officials announced today that the mixed-use proposal by Toll Brothers and Starwood Capital Group was selected from a list of seven proposals to be built alongside immediately south of the Brooklyn Bridge along Furman Street at the entrance to the park’s Pier 1, providing much-needed maintenance and operational funding for the new waterfront green space. Zig-zagging through the site, the two new buildings are composed of three distinct masses of stone, glass, and steel all topped with lush planted roofs and terraces. Rogers Marvel countered the linear horizontality the site presented with a bold facade of vertical stone panels delineating residences from the hotel. A ten-story glass tower situated at the entrance to BBP’s Pier 1 contains a 200-room luxury eco-hotel atop a lobby and two-story restaurant spilling out onto a terrace fronting the park. 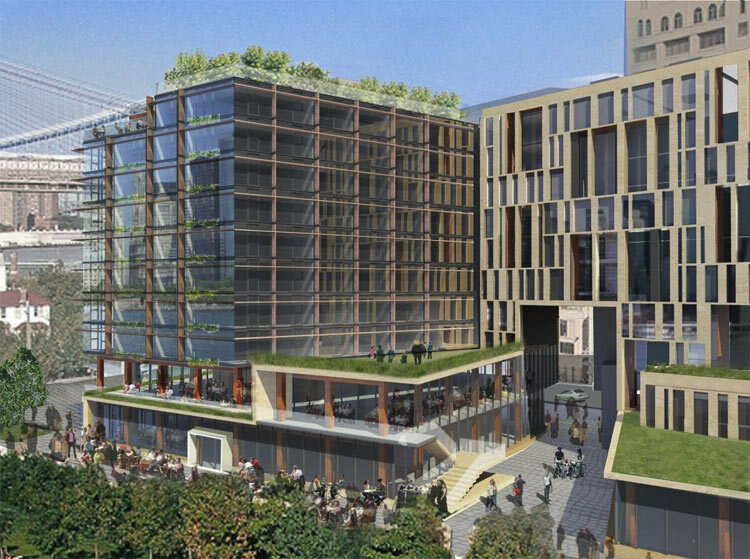 Connected to the hotel over a four-story open passageway, a terraced ten-story residential slab has been aligned to take advantage of skyline and park views. A park-side cafe sits adjacent another pass-through at the residential lobby. Small retail shops front Furman Street and banquet and meeting rooms face the park. Separated by the planned Squibb Park Pedestrian Bridge to the south, a smaller 5-story residential structure includes park amenities like restrooms and maintenance areas and includes a third access point connecting Furman Street to the park. Ground-floor residences have been pulled back from the property line to create private outdoor space alongside the park. Combined, the two new buildings encompass 550,000 square feet, including 159 apartments and 300 parking spaces, and adhere to height restrictions of 100-feet and 55-feet respectively established by City Planning. 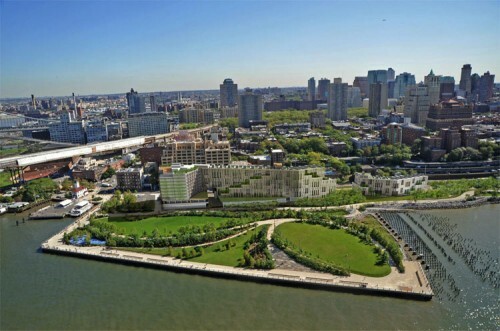 Rogers Marvel worked closely with BBP’s landscape architect Michael Van Valkenburgh to integrate the new buildings with the existing landscape, including the multiple pedestrian passageways through the buildings and a landscaped berm serving as a buffer between the development and the park, said David Lowin, vice president of real estate at Brooklyn Bridge Park Corporation. This responsiveness to the landscape and porosity within the larger building mass was important to Community Board 2 (CB2), said CB2 district manager Robert Ferris. He said the community approached the project from a functional level including how the rooftops will appear when walking along the Brooklyn Heights promenade and how light will reflect off the building in the evening. Toll Brothers and Starwood signed two 97-year leases for the two park-side parcels in a deal that’s expected to net BBP $119.7 million, or about $3.3 million annually when the buildings are complete, in payments in lieu of taxes to cover maintenance costs. 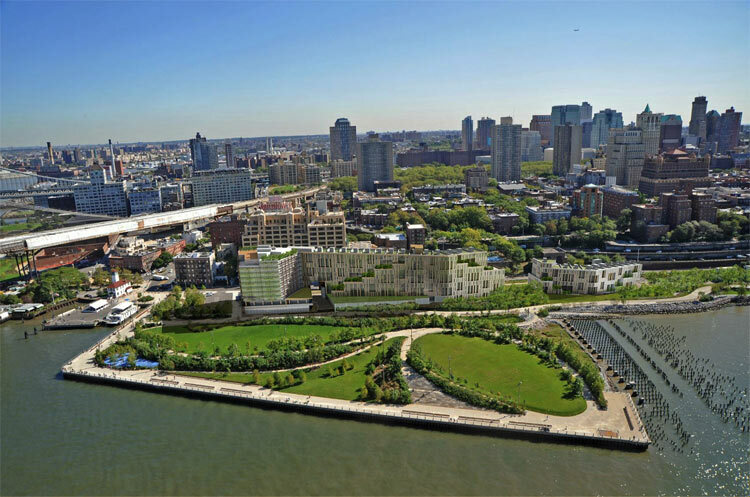 Until now, the park has relied on funds from the One Brooklyn Bridge Park condominiums at the southern end of the park to cover security, maintenance, and infrastructure costs. The public-private funding model at BBP calling for about ten percent of the park to be developed to cover maintenance costs has drawn criticism from some in the community who have charged that turning over public space for development transforms the park into a lawn for expensive residents—and the back yards of several ground-level residences back directly up to the park—but “CB2 largely accepted the proposed building program as the best way to raise the most income for the park on the smallest footprint,” said Ferris. Boundaries between public and private space, between what is the park and what is someone’s backyard need to be established in a meaningful way, he said. Toll Brothers and Starwood hope to break ground on the new buildings by summer 2013 with the hotel and residences opening in the fall of 2015.